The UN says Spain should reject controversial anti-protest legislation as it violates basic rights and freedoms. The proposed new law, referred to as a “gag law,” would introduce heavy fines for protesters and has proved deeply unpopular in the country. 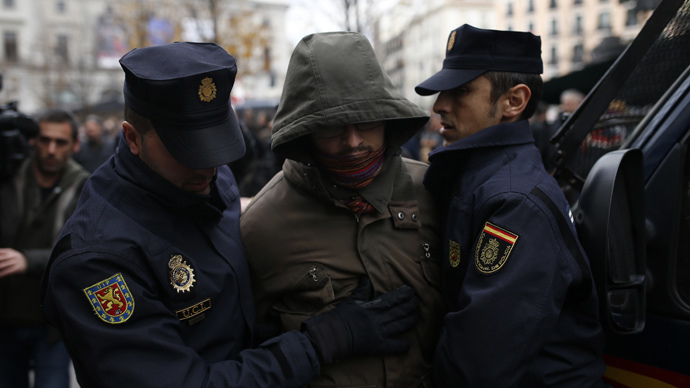 A panel of human rights experts from the United Nations said they were concerned about the Public Security Law and the Penal Code initiatives, which they say will violate Spanish people’s human rights. The proposed legislation also advocates the immediate expulsion of illegal immigrants caught trying to enter the country’s enclaves in North Africa. Maina Kiai, a UN special expert on the rights to freedom of peaceful assembly, said the reform "unnecessarily and disproportionately restricts basic freedoms such as the collective exercise of the right to freedom of opinion," AP reports. The group, which included five experts, also said the ambiguity of the new law could have “a chilling effect” on the freedom of peaceful assembly. Critics of the proposed legislation say it is an attempt by the current right leaning government to stop protests. These are related to its handling of the economic crisis, with almost 25 percent out of work. The UN group of experts also said that the new legislation was too vague. This could in theory allow the police and security forces to interpret incidents as they deem fit. Amnesty International was also fiercely critical of the proposed bills, already passed by Spain’s lower house, which it called “a serious setback for freedom of expression and assembly” in Spain. "Due to its ambiguity, this criminal code can be applied to people who are peacefully and legitimately exercising their rights," Maria Serrano, Amnesty spokeswoman, told reporters outside parliament after the vote. The latest of a number of rallies took place in Madrid on February 15, with demonstrators calling on the government to abandon the proposed legislation. They believe the government is behaving in a draconian fashion with its proposed reforms, which will see demonstrators sent to jail for certain public order offenses, while the organizers of unauthorized rallies could be slapped with a whopping €600,000 ($683,000) fine. The legislation will also see a €600 ($683) fine for showing a lack of respect to anyone in uniform, while the photographing or filming of police officers, where they could be put in danger, will incur a €30,000 ($34,100) fine. The bills are set for debate and possible amendment over the next couple of months. However, with the ruling conservative Popular Party enjoying a majority in the upper house, it is unlikely they will be rejected.